Viktor "Isildur1" Blom loses over $200,000 against RaúlGonzalez, wins some back in partypoker MILLIONS Online. 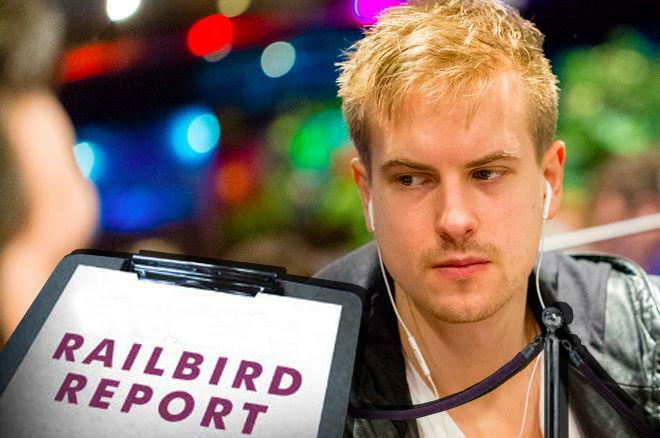 Swedish ultra-high-stakes phenom Viktor "Isildur1" Blom once again found himself the center of attention in another week of swingy high-stakes action, clocking nearly 3,000 hands at the biggest stakes PokerStars has to offer. Not only did Blom lock horns with "RaúlGonzalez" at the $1k/$2k 2-7 Triple Draw tables, a notoriously swingy game, the Swede also made an uncommon appearance in the tournament arena. The partypoker MILLIONS online with a buy-in of $5,300, a guaranteed $5 million prize pool and at least $1 million guaranteed for first, was on Blom's radar and he made it through to the final 25 after two days of playing. "Isildur1", playing under the same moniker on partypoker he's known for on other sites, eventually bowed out in 10th place on the final day, banking $59,053 in the process. It wouldn't be enough to make up for his 2-7 Triple Draw losses, but more on that below. Jonathan "sordykrd" van Fleet, better known as "Apestyles", won the event and collected $1,027,000. The entire final day of the partypoker MILLIONS online can be viewed below, courtesy of partypokertv on Twitch. The video starts with Blom's elimination in 10th place. 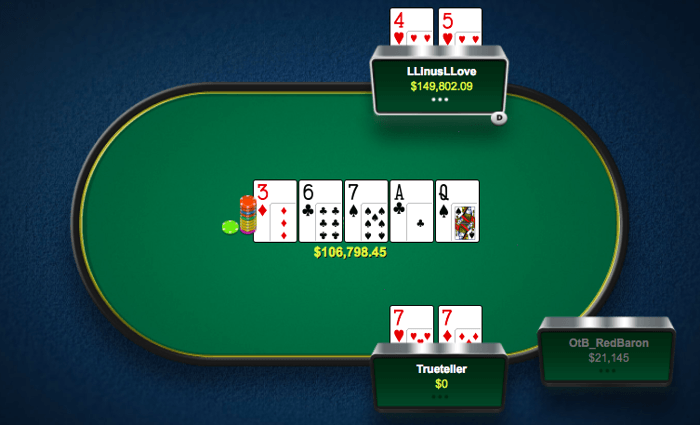 The biggest pots of the week were between Linus "LLinusLLove" Loeliger and Timofey "Trueteller" Kuznetsov, who played multiple 500-plus big blind pots at $100/$200 PLO 6-Max. Three of the best players in the world took to the felt to battle in some no-limit hold'em. 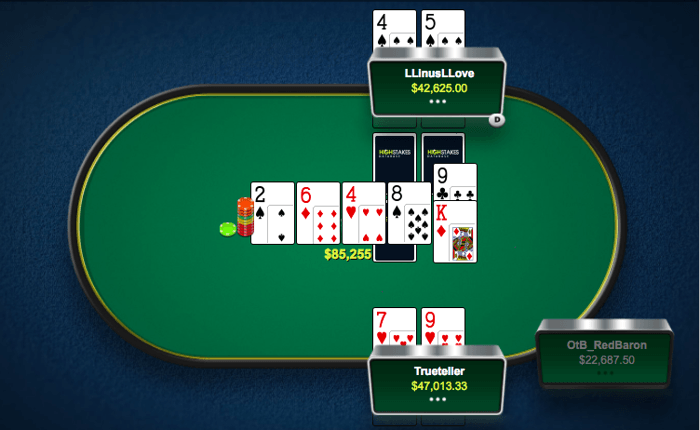 Linus "LLinusLLove" Loeliger opened the button for $502 and Jonas "OtB_RedBaron" Mols folded his small blind. Big blind Timofey "Trueteller" Kuznetsov 3-bet to $2,600 and Loeliger called. 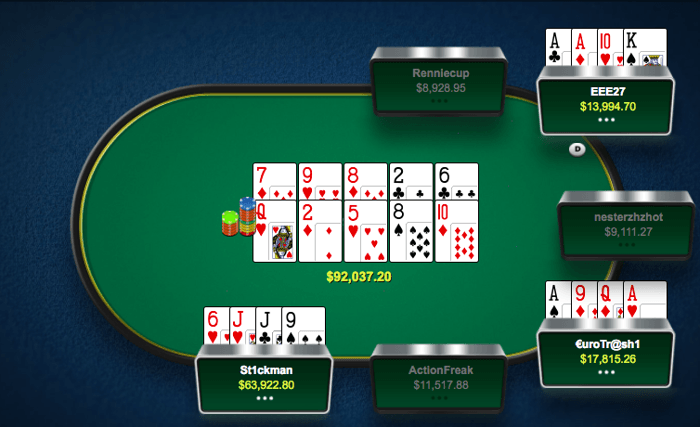 With already $5,300 in the middle, the flop came . Kuznetsov checked and saw Loeliger bet $2,118. Kuznetsov check-raised to $8,000 before Loeliger three-bet to $17,719. Kuznetsov called. The hit the turn and Kuznetsov led for $6,400 into $38,621. Loeliger called to grow the pot to $51,421. With the completing the board, Kuznetsov shoved for $27,688. Loeliger had an easy call with for the flopped nuts. Kuznetsov mucked his for the flopped set. From the hijack, Sergey "St1ckman" Vasiliev opened for $470. "EEE27" called from the button before big blind "€uroTr@sh1" squeezed to $2,050. Vasiliev called but now "EEE27" resqueezed to $8,840. "€uroTr@sh1" four-bet to $27,330 and Vasiliev called all in for $21,252. "EEE27" shoved for $35,247 and "€uroTr@sh1" called. The trio decided to run the entire board two times. The first time it came , giving Vasiliev a winning two pair. The second time, the board came to give Vasiliev a straight. Vasiliev took down the main pot, while the side pot was split between "EEE27" and "€uroTr@sh1". Loeliger raised to $502 on the button and Mols folded the small blind. Kuznetsov three-bet to $2,400 from the big blind and Loeliger called in position. Kuznetsov checked the flop to Loeliger, who bet $1,958.45. Kuznetsov check-raised to $7,200 and Loeliger called. On the turn, Kuznetsov overbet shoved $37,365.83 into the $19,300 pot. It was for effectively Loeliger's remaining stack of $32,977.50, and he called to create an $85,255 pot. Loeliger held a 4:1 lead with his pair, combined with flush and straight draws. The players agreed to run it twice. Kuznetsov spiked a on the first river to claim the first half of the pot. The second river was the and Loeliger scooped up the other half to chop the pot. Besides his deep run in the partypoker MILLIONS Online, Blom was also involved in some heavy cash game action, most notably against "RaúlGonzalez". To call high-stakes poker swingy at times is obviously quite the understatement. Last week, "RaúlGonzalez" nearly wiped out all his profit of 2017 in heads-up sessions against Ben "Sauce123" Sulsky. This week, however, "RaúlGonzalez" moved on from Sulsky to Blom and recuperated all of his losses - and then some - against the Swede. With the two battling it out at the $1k/$2k 8-Game and 2-7 Triple Draw tables, it was "RaúlGonzalez" who would take more than $200,000 from Blom in a high-octane 2-7 Triple Draw session. "RaúlGonzalez" ended the week on a profit of $361,015, making him by far the biggest winner of the week. Blom, coincidentally, is this week's biggest loser and dropped $213,348 to put him below the $1M-profit mark for the year. The second biggest loss of the week was for, Elior "Crazy Elior" Sion, who won the $50,000 Poker Players Championship at the 2017 World Series of Poker. Sion joined for high-stakes 8-Game action and played 2,001 hands over the week, in which "Crazy Elior" lost $154,353 in total. The top three of both biggest winners and biggest losers this year remains unaltered. Both "BERRI SWEET" and Kuznetsov added to their yearly totals, which are now at $1,850,281 and $1,794,515, respectively. With one month remaining, it will be interesting to see which one of them claims the top spot at the end of the year. As noted earlier, Blom dipped below the 1M mark due to his $213,348 loss and sits in distant third with +$933,005. At the other end, Sami "Lrslzk" Kelopuro lost $85,475 to bring him to -$1,365,045 for the year. "8superpoker, third on the list, lost $10,192 and is now down $700,353 in 2017. Dani "supernova9" Stern is retired and didn't play any hands. The above top winning and losing players in online poker for 2017 only takes PokerStars accounts into consideration. All public data courtesy of HighStakesDB.com. If you want to opt out of being listed in this PokerNews update on the high-stakes action, send an email with your username to frank@pokernews.com.